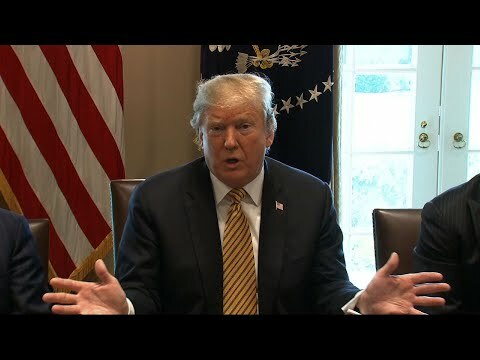 WASHINGTON (AP) — Abandoning his threat to immediately seal the southern border, President Donald Trump warned instead that he’d slap tariffs on cars coming to the U.S. from Mexico unless the Mexicans do more to stop the flow of migrants and drugs to the U.S. In his latest backtrack in recent days, Trump told reporters Thursday he would try the “less drastic measure” before resorting to his standing border-closure threat. It was the latest, seemingly sudden attempt at new leverage by a president struggling to solve what his administration has called a border “crisis.” And it was a dramatic departure for Trump, who last week tweeted that he would close the border or large swaths of it this week unless Mexico immediately halted “ALL illegal immigration coming into the United States” — a seemingly impossible task. Trump said at the time that he was “not kidding around,” and his acting chief of staff Mick Mulvaney said in a television interview Sunday that it would take “something dramatic” for Trump not to close down the crossings. Since then, however, White House advisers, border city leaders and U.S. economists have warned that such a move would have enormous economic consequences on both sides of the border, interrupting supply chains and boosting U.S. consumer prices on everything from avocadoes to autos. Trump in recent days has also backtracked on his push for Republicans to again take on health care and surprised his own education secretary by reversing a plan to ax federal aid for the Special Olympics . Those actions have only added to longstanding concerns about whether Trump’s words can be trusted. Trump, who has long said his unpredictability is one of his greatest negotiating assets, has also followed through with some of his most bombastic threats, including forcing the country’s longest-ever government shutdown over border funding. Trump had already appeared to be easing off his border threat earlier this week. Though he said Tuesday all options remained on the table, he shifted his goal posts, calling on Congress to pass immigration legislation to avert a closure and praising the Mexican government for doing more to apprehend migrants traveling through the country from Central America — though it’s unclear anything has changed. Jesus Seade, the Mexican undersecretary for North America, also brushed off the threat of new tariffs, saying officials were “not concerned” and noting the tariffs are not part of the United States-Mexico-Canada Trade Agreement that the countries have agreed to but not yet ratified. On Thursday, Trump also threatened tariffs if Mexico doesn’t halt the flow of illegal drugs across the border, saying he’d give the country “a one year warning” to comply. Trump has wide-ranging power to impose tariffs on national security grounds, which he has repeatedly used as leverage against other countries. But the USMCA was worded to protect Mexico against auto tariffs based on national security concerns, and trade lawyer Daniel D. Ujczo said those provisions are already in effect under a side letter. In addition, despite what Trump suggests, Mexico, China and other American trading partners don’t pay U.S. tariffs directly. American importers pay the tariffs at the border and then must decide how much of the higher cost they can pass along to U.S. customers. Tariffs do squeeze the manufacturers who export to the U.S. from foreign countries by making their products more expensive in the United States. But there again, that can hit U.S. companies, such as General Motors, which is a major car-maker in Mexico. Trump has been increasingly exasperated at his inability to halt the swelling number of migrants entering the U.S., including thousands who have being released after arriving because border officials have no space for them. Arrests along the southern border have skyrocketed in recent months and border agents were on track to make 100,000 arrests or denials of entry in March, a 12-year high. More than half of those are families with children, who require extra care. The president’s “pretty frustrated,” said Republican Sen. John Cornyn of Texas, who spoke with Trump this week and offered to work with the administration “to try to come up with some more targeted ideas,” including changes for remittances to Mexico. Trump suggested he work with the Treasury secretary on the idea, Cornyn said. Trump has invoked other executive powers, including declaring a national emergency in an effort to secure more money for his long-promised border wall. Congress voted to block the emergency declaration, but Trump vetoed that measure. House Speaker Nancy Pelosi said Thursday that Democrats would file a lawsuit aimed at preventing Trump from “stealing” billions from federal programs and diverting the money to building barriers along the border. Associated Press writers Paul Wiseman, Darlene Superville and Luis Alonso Lugo in Washington and Peter Orsi in Mexico City contributed to this report.